Bass Pro Shops and Outdoor Channel are teaming up to bring you the Hunt for Monster Bass Sweepstakes. 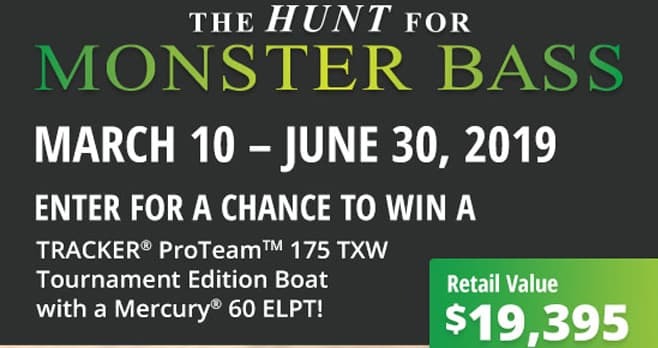 Visit basspro.com/huntformonsterbass by July 30 and enter for your chance to win a Tracker Pro Team 175 TXW Tournament Edition boat. The Bass Pro Shops Hunt for Monster Bass Sweepstakes is open to legal residents of the 50 United States or District of Columbia who are 21 years of age or older at time of entry. The Sweepstakes begins at 12:00 am (midnight) CT on 3/10/19 and ends at 11:59 pm CT on 6/30/19. LIMIT ONE ENTRY PER PERSON, PER METHOD OF ENTRY. The grand prize consists of a Pro Team 175 TXW Tournament Edition with Mercury 60 ELPT and custom trailer valued at approximately $19,395. Visit www.basspro.com/monsterbass to enter and see Official Rules for details. This contest was over July 1st why are you still advertising it on hunt for Monster bass now Sept 24 2018 ?? ?